Click on any of the pictures below to read more about our clubs and to place your order. Our "Overview" follows the photos below. Patented in 1992, our first, and still the most popular club, is the “Divnick Whole-In-One Adjustable Loft Telescopic Club” also referred to as the "Whole-In-One" and "All-In-One". The transmission inside the head can be locked on 34 lofts, including half lofts for more precise distance control. So it has more than twice as many lofts as a traditional full set of clubs. It includes 4 putter lofts, 8 wedges, and everything in between. You can play the whole game with just one club, without lugging a bag around with you. And it is great for travel, cyclists, those with small cars, retirees, or anyone wanting to walk the course but not drag a bag around with them. 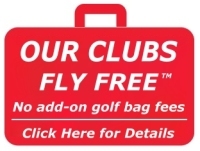 Thousands of golfers around the world enjoy the freedom of playing with our single club...and they save a lot of money when traveling because they don't have to pay for an additional checked bag. It is the shape, weight, and length of a 4-iron. So it doesn't generate as much club-head speed as a longer-shafted driver, and it doesn't feel or look like a conventional putter. It will do both, but not as well as the clubs designed for those specific tasks. Since we already had perfected the telescopic shaft, it was logical to add telescopic drivers and putters for those who want to bomb it off the tee and have the look and feel of a conventional putter. We have since added telescopic wedges, and hybrids as standard options. In fact, we produce telescopic shafts on ANY heads our customers want! Our proprietary shafts are rock-solid when extended for play, with the same performance as traditional one-piece shafts. When collapsed, they fit into your roller bag which saves a lot of money because you don't have to pay for an additional checked golf bag. OUR CLUBS FLY FREE! Many customers get a "3-Club-Set" which typically includes a Telescopic Driver, Telescopic Putter, and the Adjustable Loft club for everything in between. This has become very popular for golfers who don't want to give up anything off the tee or on the green, and still have the portability of the telescopic shafts. If you order ANY 3 clubs in April, we give you an additional 10% discount! We have even built exhibition clubs for trick shot performers that include up to a 30-foot long driver, clubs with multiple heads, and 9-Foot putters. The most unique production club is our telescopic 5-foot long BIG STIK driver with a giant DOUBLE-SIZE head that has the potential of more club head speed than the pros and long-drive champions. The 5-Foot Big Stik can hit the ball a "country mile" but without the control of conventional-length drivers! Of course, these drivers are completely illegal for USGA tournament play! But they make a great gift for the golfer who "thinks" he has everything...and they are an exciting exhibition club for fund raising at golf outings. They are, "The World's Longest & Largest Production Drivers!" Steve Divnick spoke to golf industry leaders at the January 2019 PGA Golf Convention about 4 ways our telescopic golf clubs can help increase the round's played which is the major indicator of golf industry health. While the overall golf industry is in the midst of a 10-year downturn, DivnickGolf is thriving as it fills a unique niche in the industry. Click here to read more about the presentation and see a picture of Steve Divnick with Chi Chi Rodriquez. We offer an unprecedented LIFETIME guarantee. Test your telescopic golf clubs as much as you like. Hit them hard. Give them the most demanding test you can imagine. We know how important it is to be able to test a unique piece of equipment like this. No amount of words can replace an actual test in your hands. If for any reason you don't like how they perform, you may return them for a full product refund at any time. Lifetime Warrantee: If our clubs ever break or wear out, we will replace them FREE! With thousands of our telescopic clubs being played every day around the world for over 25 years, this is an easy guarantee to provide. Enjoy your tour of our website and products.